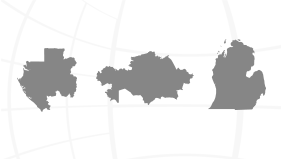 There are four mechanisms for the highly valuable undergraduate involvement in REFRESCH. 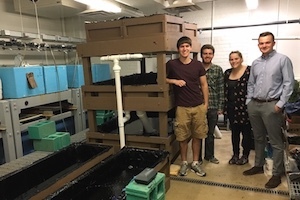 The feasibility of growing shrimp in the aquaculture system is currently being studied by a REFRESCH graduate student. Students may enroll in an EcoExplorers class in the Stamps School of Art and Design. 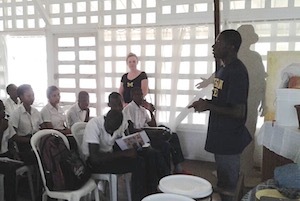 School years 2014-15 and 2015-16, this class learned about the culture of Gabon and how to build various technologies to present to the community members for feedback and codesign. Both years, in May, the class traveled to Gabon for three weeks to live and work with community members to further develop advanced designs together. The students above are testing the electric fence built to demonstrate how this technology could protect crops from wildlife, particularly elephants and mandrills. 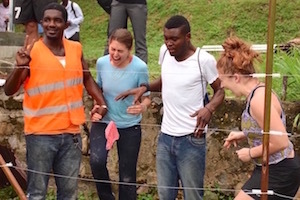 Undergraduate students who have been integrally involved in REFRESCH research and distinguished themselves in the process have had the opportunity, on a case-by-case basis, to travel to Gabon on REFRESCH-related projects. For instance, REFRESCH supported the travel of four undergraduates (alumni of the EcoExplorers class) to Gabon summer 2017 for periods of 10 days to six weeks. All of them were involved in introducing the concept of ceramic pot water filters to the local population, obtaining feedback on the level of interest. REFRESCH involves undergraduates in research. A group of four students investigated the effect of different processing conditions of the structure and properties of aluminum ingots made from recycled cans. 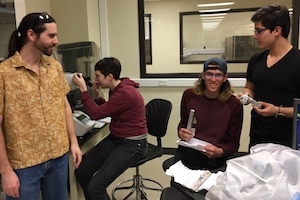 REFRESCH has hired two summer interns, one to work on characterization of clay and recycled aluminum and one to do further testing on an ME 450 projects developed the previous term. Four multidisciplinary undergraduate students are building up UMs ability to make ceramic pot water filters.